The 101 Methods With Which to Drive Out JYJ from Broadcast? At the situation in which Park Yoochun, Kim Jaejoong, and Kim Junsu, who have withdrawn from TVXQ and are newly active as JYJ, cannot appear on Television, JYJ’s fan club ‘DNBN’ has printed a full-page advertisement in a non-fee newspaper and is becoming a topic of conversation. 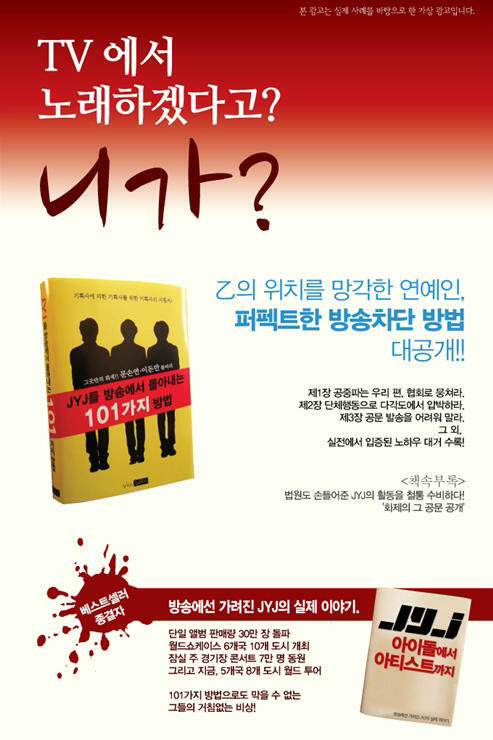 This advertisement, which is in the form of a parody of a book’s introducing, is formed in the structure of introducing an imaginary book titled “The 101 Methods With Which to Drive Out JYJ from Broadcast.” The advertisement used phrases of irony such as “You say you’ll sing on TV?” and “Entertainers Who’ve Forgotten Their Place as Contractees, the Perfect Method for Blocking Them from Broadcast, All Revealed” to describe the situation that JYJ currently faces. JYJ fans are arguing: Through the court decision in 2010 JYJ received the judgment that JYJ must be “guaranteed of freedom in activities without interference,” but that due to the interference of mega-entertainment company SM Entertainment (hereafter, SM) and the Korean Federation of Pop Culture and Art Industry (hereafter KFPCAI) which is at the beck and call of SM (T/N: literally, “tries to figure out SM’s mind and be self-conscious”) JYJ is unable to appear on TV. It is true that KFPCAI is interfering as an association with JYJ’s activities, doing such deeds as sending letters of official demands/requests for its member companies and each broadcast companies to refrain from casting or airing JYJ. Further, is the reality that the broadcasts agencies, at the beck and call of the mega-entertainment companies, too avoid JYJ’s appearances, so that JYJ cannot appear in any proper broadcast programs even though they record #1 on digital music sold. The court commanded that if an entity interferes with JYJ’s activities that it pays 20,000,000 KRW (approximately 20,000 USD) per instance, but it is that the mega-entertainment companies and broadcast companies are not taking it seriously (T/N: literally, think it light-weight). JYJ is the first case that has quit the current system of mega-entertainment companies. The question of what kind of activities they engage in is an issue that can act as the standard that can change the treatment of many idol stars who are groaning under the so-called “slave contracts,” and as such is an important question for the normalization of the entertainment industry. However, paradoxically, this has been felt as an anxiety to the entertainment companies who believe that “if JYJ shows the appearance of achieving success outside of SM, it may cause cracks in the current “trainee” system,” and is creating a consensus that whatever it takes, they must“block” JYJ from appearing on TV. This is evaluated to be a kind of a cartel/collusion with the aim that JYJ must be forced to not succeed so that they become the “example case” with which to clamp down on the trainees and the affiliated entertainers. It is an issue of attention whether due to the active activities of the JYJ fandom in society that JYJ will step over the contradiction of the entertainment industry and be able to meet with fans on a proper stage in a broader way. JYJ fans have continuously raised the problem of JYJ’s lack of appearance on TV through bus advertisements, subway advertisements, and the like. No matter what happens to the future activities of JYJ, the activities of JYJ fan clubs such as DNBN is worthy of being called the most active and passionate fandom (in history) after the “Seotaiji and the Kids” fan club, and will remain as an important signpost in its recording of the fandom’s societal activities. While group JYJ has filed a lawsuit against Japan’s AVEX for interfering with their efforts to hold a concert, Japanese fans have taken action and protesting against AVEX to stop interfering with JYJ’s activities. Furthermore, on the 19th, Japanese fans also sent a public statement which starts [with the words], “JYJ’s Japanese fans make the following demands of JYJ’s current management company, Avex” to AVEX. 1. Recognize that C-JeS is a business entity officially registered in Korea in December 2009. In Korea, JYJ has been appointed to promote the Overseas Korean Trader Association as honorary ambassadors, and to use a reason that did not cause any problem in (JYJ’s) home country, that the representative of C-JeS has himself denied, and to give the Japanese society false and negative impression of JYJ, we find your ground (that the reason was based on) to be very questionable. 2. When JYJ began their Japanese activities in April 2010, the problem regarding the affirmation of the three’s exclusive contract with SM was already resolved by the October 2009 court decision. 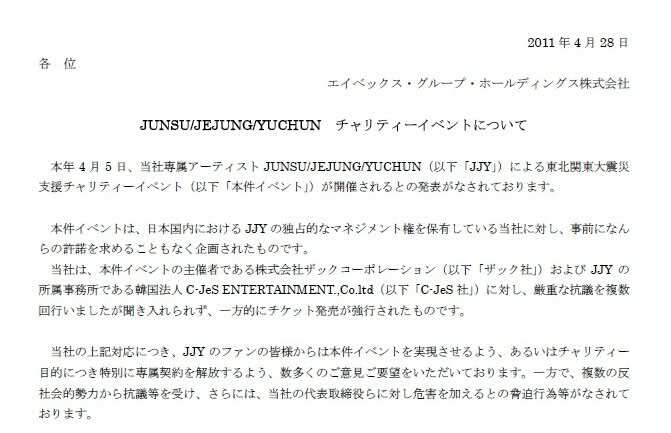 Consequently, the reason your company used to suspend JYJ’s activities, “Depending on the progress of the exclusive contract affirmation lawsuit between JYJ’s three members and SM, there is a possibility that their exclusive contract with our company may become invalid” (quote from Avex’s official statement) has been rendered a non-issue. Rather, it (the contract issue) was a problem that your company needed to resolve, as your company signed exclusive contract with JYJ while the contract signed (by Avex) with SM as Tohoshinki remained in effect, we feel your logic to make the issue a problem with JYJ is very questionable. 3. When your company, in spite of the aforementioned circumstances, used corporate compliance as a reason that your company would no longer provide management services to the three, it meant that the contract could no longer be maintained as per normal. To restrain the three with the contract while not letting them to engage in entertainment activities, we must say is very socially unjust behavior. We find it very hard to understand that in spite of the fact that both JYJ and their fans desire for (JYJ’s) Japanese activities, such a condition (the suspension of activities) has continued for as long as 8 months. This post will be updated throughout the day with tweets by JYJ. This post includes tweets from 6am KST, April 28th to 5:59am KST, April 29th. (Young Bum, 8:11am KST) @mjjeje lolol Are you back in Seoul?? This is C-JeS entertainment’s representative Baek Chang Ju. Firstly, I sincerely thank you for your unending love and cheers for JYJ. Despite a situation where JYJ was unable to do activities in Japan due to their Avex contract suspension, JYJ’s worldwide album as well as activities have received great support, and I am constantly grateful. Due to the Tohoku Earthquake that occurred last month, while the whole Japan was struck by grief, JYJ grieved as well, with the emotions of a family. So, for the sake of repaying everybody for their love, we planned a charity concert in hopes that we would recover from the Tohoku Earthquake as soon as possible. However, even though we pushed forward with the thoughts of wanting to do whatever we can, regardless of our intention, the cancellation of the concert, as well as other troubles occurred. The tickets had already been sold, and to everybody who had been looking forward to the concert, we apologise for the inconvenience caused. When I thought about the Japanese fans who had been waiting for JYJ’s performance for a long time, I decided that we cannot showcase a slipshod performance. We considered cancelling the performance, but to keep the promise that we made to the fans who have been silently waiting and believing in JYJ, we decided that the performance will go on. I will do my utmost to ensure that the performance be held as planned. For the Japanese fans, this concert is not just a one-time event, please take this to be a sign that JYJ will be starting activities in Japan from now on. Therefore, the location for this concert may be rather poor, and may be lacking. Please believe in our sincerity, and we hope that everyone will be able to support us. From now on, JYJ will not give in to such pressures, as long as it is a place where the Japanese fans can listen to JYJ’s music, we will be there. For the sake of repaying the trust of the Japanese fans, I will fight with all I have so that they can once again listen to JYJ’s music and stories. As always, please continue to be a pillar of support that JYJ can believe in, and give them your strength. As long as we believe, we can do it. JYJ has filed a lawsuit in Japan against their entertainment company Avex for the reason that it interfered with the concert with which to aid Japan’s damages due to the large earthquakes. Avex has revealed its official position on this issue. At the same time, JYJ filed for two injunctions in the Tokyo District Court, arguing that: “Avex has engaged in an unjust act in interfering with the concert to aid Japan’s damages from the earthquakes that was to be held on April 5.” At this, Avex has revealed their official position that “to do so was only a just act in order to protect our legal rights” and the issue is gathering attention. Avex still believes that JYJ will let the company manage them again in Japan after all of these bullsh*t that they’ve been doing to the trio? Get real and cut the crap, Avex! With what you’re doing to them, I’m sure it will take a lot of effort to get the trust of these boys again. You’re just as bad as SM Entertainment! There was an announcement on April 5 this year, that JUNSU/JEJUNG/YUCHUN (exclusive artists of our company, hereinafter named “JJY”) will hold a charity support event (hereinafter called “this event”) for the Tohoku Kanto Earthquake Disaster. This event was planned without receiving any permission from our company, which holds the exclusive management rights for JJY in Japan. Our company has protested multiple times to the organizer ZAK Corporation (hereinafter named “ZAK Corp”) and JJY’s Korean management company, C-JeS ENTERTAINMENT, Co.ltd (hereinafter named “C-Jes Corp” ). However, they have not listened to our protests, and forced through with the ticket sales unilaterally. Concerning our company’s above handlings, we have received many comments and requests from JJY fans that this event should push through. Or, that since the sole purpose is for charity, we should especially dissolve the exclusive contract. On the other hand, we have received protests from multiple antisocial forces. Furthermore, we were under duress that our president should be harmed, etc. However, our company holds the exclusive rights for JJY’s activities in Japan, and we have just taken actions for the infringement rightfullly and properly. Additionally, as we have announced in our press release of September 16 last year, there remains to be compliance problems such as the criminal record of the President of C-JeS in assaulting/blackmailing an artist (of whom he was in charge of). Moreover, the exclusive contract declaratory judgment is still going on in Korea. Therefore, we have no other choice than to suspend the activities of JJY until these are settled. In spite of the above circumstances, ZAK Corp and C-JeS have in their joint names, and, as ZAK Corp by itself, have filed two provisional dispositions against our company to the Tokyo District Court, claiming that our company’s handlings have no legitimate basis. Hereafter, our company will contend our legitimacy at the judicature. Our company does not think that the JJY members themselves are aware of everything that is happening. 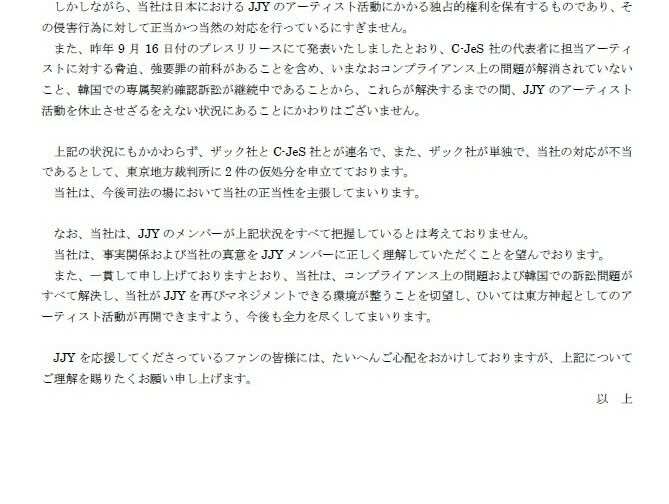 Our company wishes that the JYJ members will understand the situation correctly and the real intention of our company. Additionally, as we have been consistently commenting, our company long for the day where the compliance and legal problems in Korea will be resolved, and that our company can once again manage JJY. Furthermore, to resume the artists’ activities as Tohoshinki . We will do our best in the future. For the fans who support JJY, we understand that we are making all of you worry. We appreciate your kind understanding on the above.